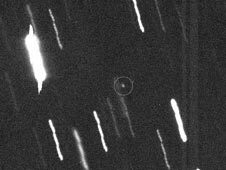 The asteroid Toutatis passed 18 lunar distances (6.9 million kilometers) away from the Earth on 12 and 13 December 2012. NASA has released a movie based on a series of radar images taken by the Deep Space Network antenna at Goldstone, California. 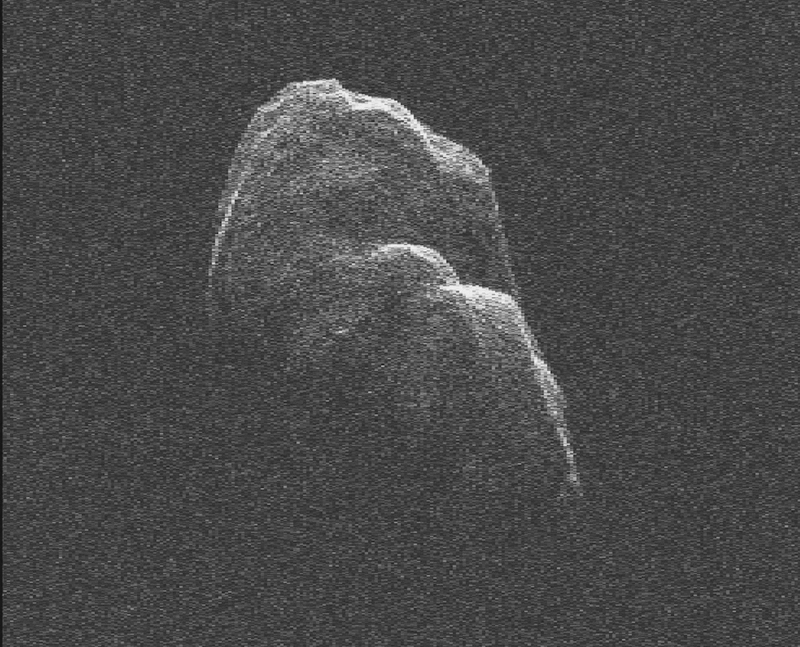 Toutatis is an elongated asteroid with a maximum length of about 4.8 kilometers. It tumbles slowly, once every 5.4 days, and precesses like a badly thrown football around the long axis every 7.4 days. Currently, its orbit will bring it back to the Earth’s neighborhood in 2069 and it will pass by at a distance of about 3 million kilometers. 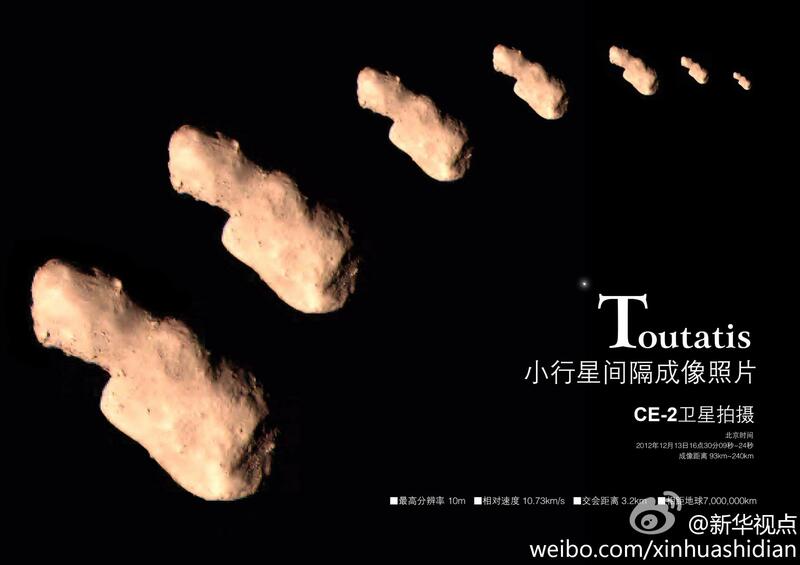 Tracking Toutatis is the job of Near-Earth Object Observations Program. The program discovers and tracks asteroids and comets and plots their orbits to determine if any could be potentially hazardous to our planet. Given the intent of the politicians to fight for the funding their districts currently receive from the Constellation Program (CxP – the current program developing the Ares I and Ares V rockets) as well as go begging for more, and given the budget constraints the NASA faces, it is instructive to see where this course will end up. In the Senate, Richard Shelby has announced his intention to fight for Constellation and will try to increase funding to the Marshall Space Flight Center in Alabama. Senator Bill Nelson of Florida is fighting for Kennedy Space Center and all the jobs and funding there. In the House, Gabrielle Giffords of Arizona and Pete Olson of Texas have dug in their heels and reiterated their backing of the Constellation program (See Space News, 21 November 2009). All this is taking place against the backdrop of the Augustine Commission’s Final Report, which has made it clear that Ares I is over budget and underpowered. As Jeff Greason said at the Committee deliberations, if Santa Clause gave us Ares I and Ares V tomorrow, we would have to scrap them immediately because they would be too expensive to operate. The Forum at NasaSpaceFlight has been for many years the authoritative site for information on all things NASA. It has been home to the rebel alliance of NASA and industry engineers that have advocated the in-line shuttle derived launch vehicle for the past four years. The source of this concern was former Administrator Michael Griffin’s decision in 2005 to replace the dual-launch, in-line shuttle derived architecture recommended by NASA engineers, with his personal choice of a small Ares I and a very large Ares V. Instead of building one rocket using existing shuttle components as Congress had directed, he would build two brand new rockets. This decision came just two weeks before the scheduled release of the NASA document on the Constellation program. 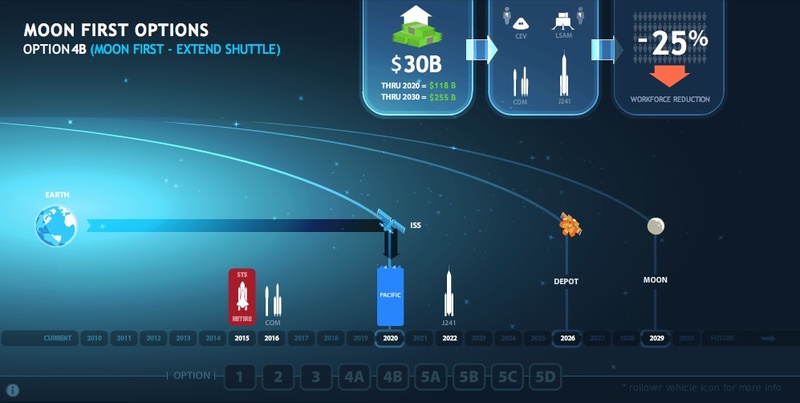 Now, four years later in 2009, when the in-line shuttle derived launch vehicle should have been making its first flight, we are five or six years away from Ares I making its first flight. The Shuttle is scheduled for retirement next year and America will have to buy seats on the Russian Soyuz to get to the International Space Station. And the International Space Station is scheduled for de-commissioning in 2015 and would be de-orbited into the Pacific Ocean. This reality gave birth to the Augustine Commission and its Final Report. We have covered in detail the findings of the Committee. Now we look to consider the possible outcomes. Philip Metschan (writing as ‘Phoegh’), a long time contributor to the Forum at NasaSpaceFlight, has produced a marvelous interactive series of graphics available at directlauncher.com that illustrate the options identified by the Augustine Commission. The Budget and Time Line for these options are given in the following table. Included are destinations beyond low Earth orbit (LEO) and the impact of each option on the existing workforce. Option 1 – Ares I crew vehicle is ready a year after the ISS is de-orbited (2015) and Ares V is completed in 2028 with no funds to conduct exploration. There is no Moon in the picture. Option 2 – Scrap Ares I and substitute Commercial Crew Access to LEO. The money saved is used to keep the ISS operating until 2020. 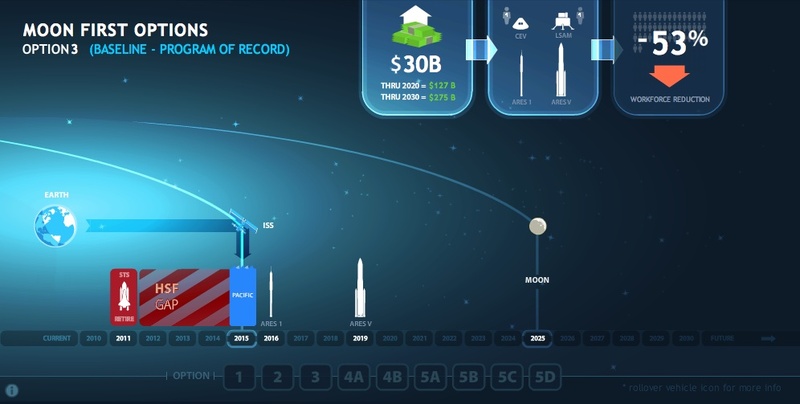 Ares V is completed in 2028 with no funds to conduct exploration. There is no Moon in the picture. Option 3 – Add $3 Billion per year to the existing program. Ares I crew vehicle is ready a year after the ISS is de-orbited (2015) and Ares V is completed in 2019. 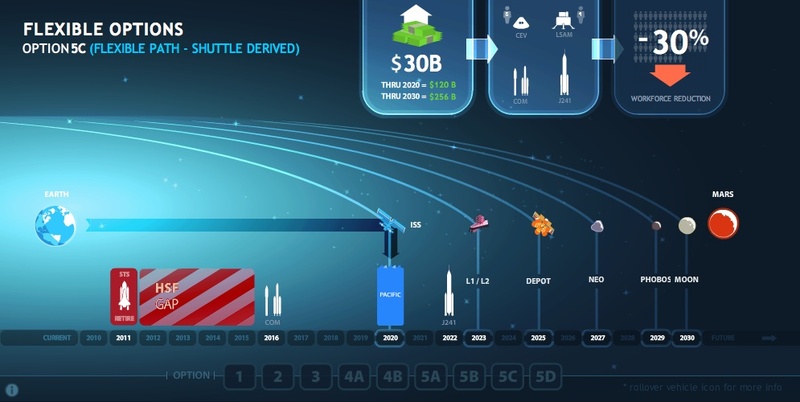 The Moon is reached in 2025, but no other destinations beyond LEO can be funded. Option 4 – Add $3 Billion per year to the existing program. Scrap Ares I and substitute Commercial Crew Access to LEO. The money saved is used to keep the ISS operating until 2020. Ares V is completed in 2023. The Moon is reached in 2030, but no other destinations beyond LEO can be funded. Option 4B – Add $3 Billion per year to the existing program. 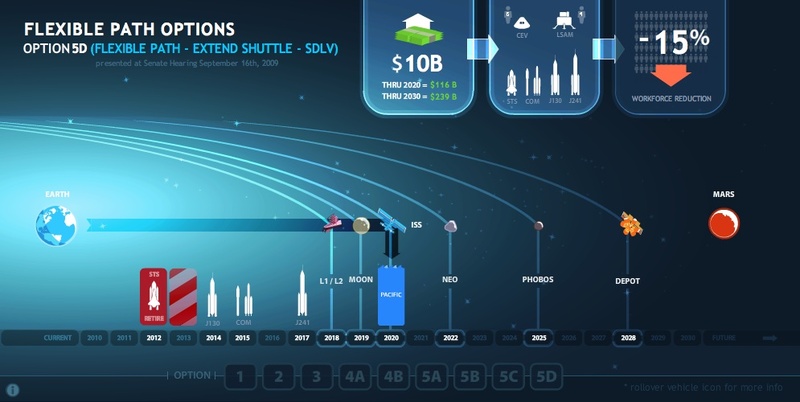 Extend the Shuttle to 2015. Scrap Ares I and substitute Commercial Crew Access to LEO. The money saved is used to keep the ISS operating until 2020. 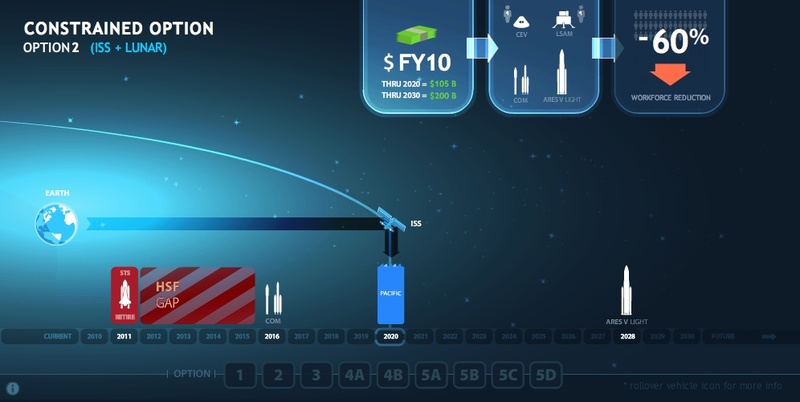 Ares V is completed in 2023. 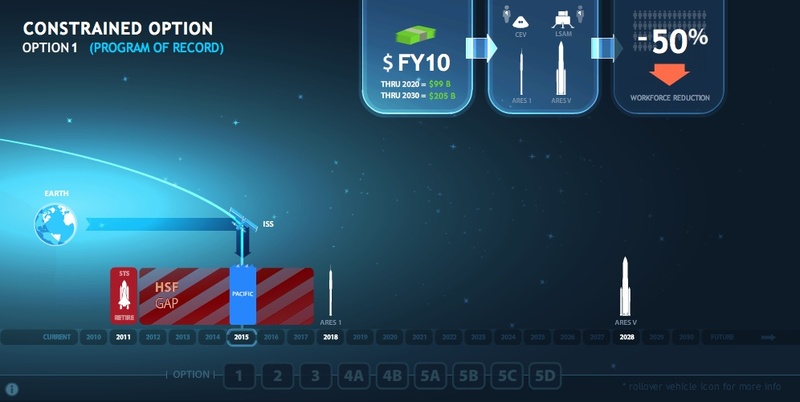 Develop the Propellant Depot by 2026. The Moon is reached in 2030. Option 5A – Add $3 Billion per year to the existing program. Scrap Ares I and substitute Commercial Crew Access to LEO. The money saved is used to keep the ISS operating until 2020. Scrap Ares V in favor of a smaller Ares V Lite, which is completed in 2023. Visit EML-1 or EML-2 in 2026. Visit a Near Earth Object (NEO) Sometime in the Future. Option 5B – Add $3 Billion per year to the existing program. Scrap Ares I and substitute Commercial Crew Access to LEO. The money saved is used to keep the ISS operating until 2020. Scrap Ares V in favor of a commercial heavy launch capability, which is completed in 2021. Develop the Propellant Depot by 2024. Visit a Near Earth Object (NEO) in 2026 and Phobos in 2028. Return to the Moon in 2029. Option 5C – Add $3 Billion per year to the existing program. Scrap Ares I and substitute Commercial Crew Access to LEO. The money saved is used to keep the ISS operating until 2020. Scrap Ares V in favor of a the Direct Team’s Jupiter 241, which is completed in 2022. Visit EML-1 or EML-2 in 2023. Develop the Propellant Depot by 2024. Visit a Near Earth Object (NEO) in 2027 and Phobos in 2029. Return to the Moon in 2030. Those are the options explored by the Augustine Commission in their Final Report. Add $1 Billion per year to the existing program. Scrap Ares I and develop the Jupiter Core (Jupiter 130) for carrying crew on Orion to LEO and ISS by 2014. Develop Commercial Crew Access to LEO to replace the Jupiter 130 by 2015. Use Jupiter 130 for ferrying the few large payloads needed by ISS. Continue ISS operations until 2020. Scrap Ares V in favor of the Upper Stage for the Jupiter Core (Jupiter 241 or Jupiter 246), which is completed in 2017. Visit EML-1 or EML-2 in 2018. Orbit the Moon in 2019. Visit a Near Earth Object (NEO) in 2022. 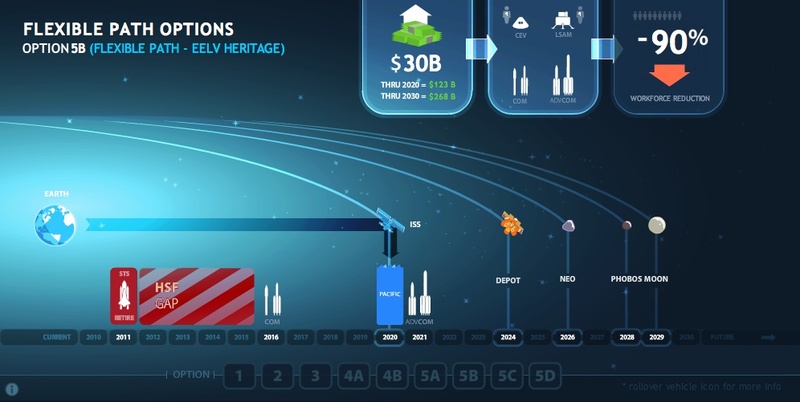 Develop the Propellant Depot by 2028. The key here is that the goal of expansion of human civilization into the Solar System is better served, is accomplished sooner, and costs less. Indeed, even without the additional $1 Billion per year, only the extension of the Shuttle operation need be eliminated. Options 1, 2 and 3, which are favored by the politicians with space flight facilities, get us nowhere and cost far too much. Options 4 and 4B get us to the Moon, but neither builds infrastructure for support of future exploration. Options 5A, 5B and 5C builds the skills and infrastructure for space exploration, but leave us a crew to LEO gap of five to six years. Option 5D builds the skills and infrastructure for space exploration, reduces the crew to LEO gap to one or two years, and gives the international community the ability to descend to the surface of the Moon and Mars. Finally, this note about the political realities. First, if a decision is delayed for four to six months while the politicians fight for every last bit of funding they want, the infrastructure on which the Jupiter program builds will be dismantled and Options 4B, 5C and 5D will be eliminated. Second, Congress will likely decide that the Constellation program as currently envisioned is too costly for what will be developed and not worth throwing more money down the drain. Options 1, 2, 3, 4B and 5A will be eliminated. Thus, only commercial crew and cargo capabilities will be funded. NASA will be reduced to research and contracting for services. The Marshall Space Flight Facility will have little purpose. And the politicians will lose most of the jobs and funding that their districts currently enjoy. Special thanks are in order to Philip Metschan for permission to use screen shots of his presentation. Over time, the risk level has gradually been lowered as additional measurements have been made. As early as 3 February 2005, NASA ruled out a collision in 2029 (Friday the 13th, April), when it would come no closer than 36,350 kilometers above the Earth’s surface. However, this still left open a possible encounter in 2036. 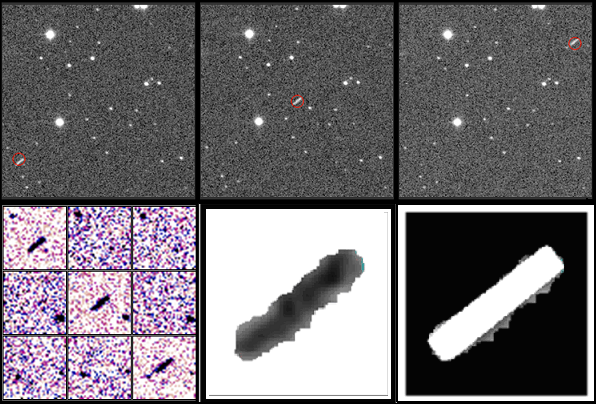 Now, observations made by the 2.3 meter (90-inch) Bok telescope at the Kitt Peak National Observatory near Tucson, Arizona, along with measurements from the Arecibo Observatory on the island of Puerto Rico have been combined with observations by Dave Tholen and collaborators at the University of Hawaii‘s Institute for Astronomy in Manoa. The previous estimate for 2036 was one-in-45,000, The new refined estimate is one-in-250,000 (6 times less likely). …the asteroid is expected to make a record-setting — but harmless — close approach to Earth on Friday, April 13, 2029, when it comes no closer than 29,450 kilometers (18,300 miles) above Earth’s surface. See Eric Berger’s Blog on Preparedness for NEO Impacts on the Earth. Also, its a crowded Solar System.